Man caught on-camera stealing nearly $20K worth of equipment from storage facility | Crime Stoppers of the Lowcountry: 554-1111 | 1-888-CRIME-SC | Anonymous tips earn cash rewards with Crime Stoppers of the Lowcountry. 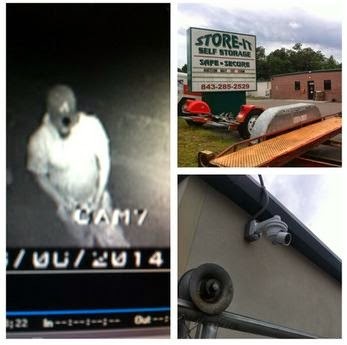 MONCKS CORNER, SC (WCSC) - A thief caught on camera stealing nearly $20,000 worth of equipment from Store-it Self Storage in Moncks Corner. The victim is hoping you can help track down the suspect. There are many clues in the surveillance video. Padlocks are on just about every door, surveillance cameras at each corner and a pass code to get it. The goal is to keep unwanted people out of the storage facility on S. Live Oak Drive. But the surveillance cameras didn't stop one man from committing a crime in plain view. Dan Huot said, "Early Friday morning an individual broke into the storage facility." Footage from the surveillance camera shows the crime. "He cut the chain, opened up the exit gate and cut the lock off of my trailer and took off with it," said Huot. Huot says he's invested nearly 20 grand in the equipment that was stolen within minutes. "He wasn't in here very long, about seven minutes from the start to finish," said Huot. Huot says he's studied the video, trying to map out what happened. He says there was a lot of equipment inside his black trailer. "We have two four wheelers, a Yamaha Raptor and a Yamaha Grizzly," said Huot. He even went ahead and posted a picture on Craigslist just in case the crook tries to use the site to sell any of the stolen equipment. "Helmets and riding gear, gas cans and coolers, an extra set of tires for the grizzly," said Huot. Huot is hoping someone recognizes the suspect. "He's got a tattoo on his lower left inside arm wearing an Atlanta Braves hat and drives a newer model dark colored dodge truck." Anyone with information should contact the Berkeley County Sheriff's Office or call Crime Stoppers. ?